This year there is a new 4 ply yarn in Maniototo Wool. I haven’t been much of a 4ply knitter. Knitting with thicker yarns is just so much faster….. and I like to see a finished “thing” as quickly as possible. Rough Ridge 4ply is a beautiful soft woollen spun yarn. The name comes from the geographical location called Rough Ridge in Central Otago where the sheep who provide the wool are bred and farmed. I was thinking that the yarn might suit something with a little bit of lace. So for a first project I made a hat for 9 year old Emily. The pattern was “Stones on the Beach Hat” by Jennifer Knight. I used 3mm needles, and being unused to fine knitting and sharp pointy needles, I had sore fingers by the end. However, I think the simple lace works well in the yarn. The hat is a little bit slouchy and topped with a possum pompom. It has been sent to Germany where Emily lives. Then for a larger project, which I knew was going to take a long time. I tackled “Kea” a very architectural shawl by Amy Van der Laar designed for Brooklyn Tweed Loft but perfect in Rough Ridge 4 ply. I overdyed the natural colour of the yarn with a pale lavender so that the underlying heathered look remained. 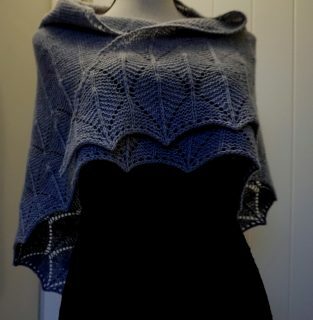 Surprisingly, for a person who likes to knit FAST, I have really enjoyed the process of the actual knitting of this shawl. 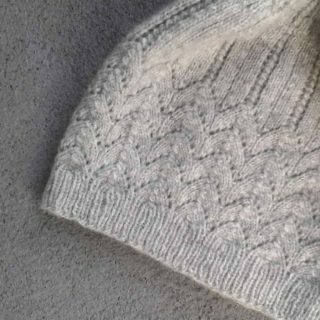 The pattern is so clever and I’m loving the feel of the wool yarn as Amy’s intricate shapes emerge from the knitting needles. The needle is a little larger – 3.75mm, so easier on the hands. This new yarn will lend itself to many different kinds of projects. People have purchased it for adult sized cardigans and pullovers. I really look forward to seeing the finished projects and hope that the knitters will record them on ravelry for all to see. Rough Ridge 4ply is available here on the website in natural undyed skeins. If you want to buy the yarn overdyed, Helene from Happy Go Knitty has applied her expert dyeing skills to it, and named it “Aroha”.